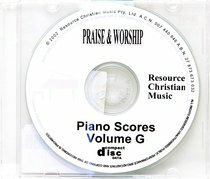 Customer Reviews For "Rcm Volume G Full Piano Version on CDROM (Supp 38-42)"
I found it hard adjusting to having the music on CD's; however, I am finding it OK as you can just print out the songs you want and save paper. Although it does cost a little for the paper and ink, and takes a little time to print them off, I have found buying the music on CD not too bad. Although I think if I was given a choice I would still buy the music in a songbook format for ease of use (at the time I purchased the CD there was no songbook available). The songs are in pdf format - so none of this fiddling around with "strange" programs etc. While my CD had some of the songs in the wrong Supplements (pdf's are organised in supplement folders), all of the songs were there. The copyright information at the bottom of the music seems to be a bit low as sometimes my printer only prints out the top half of the words. I don't have a very good printer so this may not be problem for you. I found this volume quite good - some of my favourite songs are: "The Wonderful Cross" by Jesse Reeves and Chris Tomlin, "Oh To See The Dawn (The Power of the Cross)" by Keith Getty and Stuart Townend, "Still" by Reuben Morgan, "He Reigns" by Peter Furler and Steve Taylor and "Majesty" by Martin Smith and Stuart Garrard.